The Argent Tournament is a new level 80 daily quest hub in Northeast Icecrown, near Sindragosa’s Fall. The Argent Tournament is, of course, initiated by the Argent Crusade, but participating factions include every capital city of Horde and Alliance, and the Ebon Blade (though the extent of their involvement is of yet unknown). 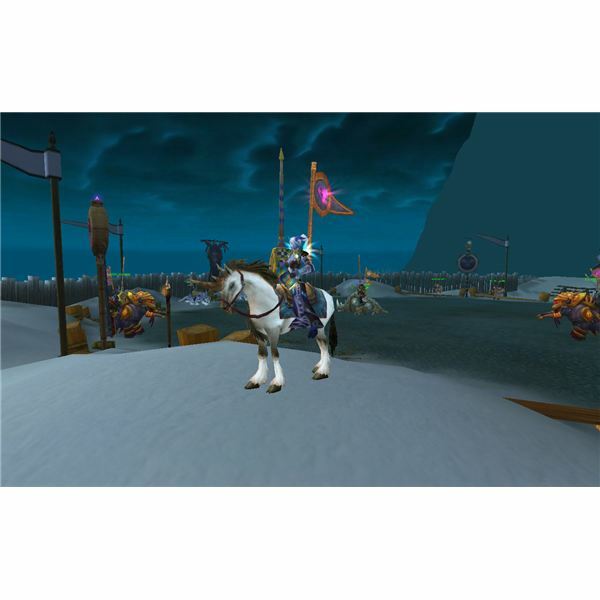 The Tournament invites all heroes of the Horde and Alliance to come together in a santuary (PvP Neutral area) and pit their mounted combat skills against one another in an organized dueling competition. The event strays away from your typical Warcraft hack slash and shoot fireballs – It has actually been designed to center around the medieval sport of Jousting. Once initiated into the tournament, players will pick up a lance, mount a special "vehicle" horse or hawkstrider, and use various jousting abilities to defeat their opponents. Through quests and accomplishments players build up status within the tournament and with the faction they are representing. A player who just arrives at the tournament is called an Aspirant, and is awarded Aspirant’s Seals as he works towards the next rank: Valiant. From Valiant players can become Champions. Once reaching the rank of Champion, players will earn Champion’s Seals which can be used to purchase special items. By now most level 80 players have probably received their own personal invitation to join the Argent Tournament via the in-game mail system. There is a direct flight available from Dalaran to Northeast Icecrown, where the tournament is based. To fly from Dalaran to the Argent Tournament players must speak to the NPC Jean Pierre Poulain <Argent Tournament Valiant> located near the flight master in Krasus’ Landing. Alternatively, you can simply fly yourself there. The flight paths in western Storm Peaks are closest. The Argent Tournament is directly north of Sindragosa’s Fall, in the Northeast corner of Icecrown. When you arrive, one of the first things you will come across are two goblins offering daily quests: A Chip Off the Ulduar Block, and Jack Me Some Lumber. These quests are to assist with the building of the Coliseum, which will, in the future, be patched in to add further to the Argent Tournament events. This is somewhat similar to the way dailies in the Isle of Quel’Danas were introduced back in the Burning Crusade. The other NPC you need to pay a visit to is located in the Southwest corner of the Argent Tournament area, in a pavillion (fancy name for big tent). Justicar Mariel Trueheart gives the quest The Argent Tournament which introduces you to the area and sends you to speak with your faction’s representative. The Horde rep is in the Southeast corner and the Alliance rep is directly North of Horde’s. Mastery of Melee – The first thing you need to do with this quest is equip the lance you are given. Then, go outside the tent and jump on the vehicle horse or hawkstrider. It then sends you to talk to a training NPC that will teach you how to use the Defend and Thrust abilities. You need to practice these on the targeting dummies. Dummies for all quests are located in the north area of the Argent Tournament, above the coliseum-in-progress. The melee target dummy is farthest west. Prior to approaching the dummy use your Defend ability three times to get maximum protection. Floating shields in red (1), yellow (2), and green (3) indicate your Defend stack. Approach the targeting dummy and attack with button 1: Thrust. The dummy will hit you back, removing a charge from your Defend, so you need to keep using the ability to reinforce your defenses. You must successfully use Thrust on the targeting dummy five times to complete the quest. Mastery of the Shield Breaker – As with the above, equip your lance, jump on the mount, and go to the area with the targeting dummies. Speak to the designated NPC to learn more about the ability. You need to use the Shield-breaker ability while standing away from the Ranged Targets. You’ll need to use it five times: 3 to break through the defenses, and twice to hit the target for quest credit. Mastery of the Charge – Same as above, but this time you’ll be beating up on the Charge Target dummies. Use Shield-breaker before charging the dummy. When you charge your vehicle will continue running a good distance past the target – don’t be alarmed. Do this twice to complete the quest. Learn how to use queues to your advantage in World of Warcraft’s ranked arena system.